Sew! Can! 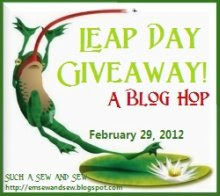 Kenna: Leap Day Give Away! I did a bunch of stash organizing last night and have not one, not two but THREE giveaways today! A Moda Candy Bar pack! In it is a 2 1/2 by 5 inch charm of Fandango, Bliss, City Weekend and Breakfast at Tiffany's! A bundle 7 coordinating fat quarters (almost 2 yards!!) of Art Gallery "Girly Girl" and coordinating fabrics. Whew! Giveaway Closed!! Thank you for all your comments! 2-Be a follower of the blog! 3-If you're a no reply blogger PLEASE leave a way for me to contact you. That's it :) The Give Away will close at 8 am PST on March 1. I will choose a winner using a random number generator and will keep picking until all 3 items have been given away! Make sure you check out all the other blogs on the hop to see what goodies are being given away!! How fun! I think I would like the candy bars. Oh, you make it hard as I like all of these fabrics and have used them at one time or another. But I have never had the candy bar packs, so cool how they package them. Oh!!! I love that little candy bar box... I would be delighted if I won this! I'd be happy with the rest too... thanks for sharing! Can I say I would be happy with any of these but in order of preference #3, #1, #2. This is such a fun and exciting bloghop. I have found lots of new and interesting blogs to follow (including yours). Thanks for taking part in the Leap Day giveaway. I love the bar pack! Great giveaway. Ooh...you make it so hard...I like them all...but in order #3, #1 and #2. They are all gorgeous. Thank YOu. What a great giveaway!! 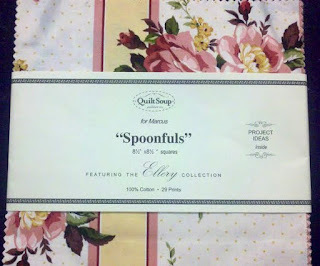 I would especially like the Moda Candy Bar set and the Fat Quarters, but would be very happy with Spoonfuls, too! I am so happy that this Blog Hop led me to your blog - I am a new follower. The candy bars are so cute! I'm a brand new follower, here from the hop. Thanks for the chance to win! I like the candy bars. I have 2 of those 4 lines in the little bars and it would be AWESOME to do a bigger project with them. I am a new follower and I would choose I think in this order 1, 3, 2~ thanks! I'm a new follower, and I'd love to win the Candy Bars! Thanks! Oh, I love them all! It's so hard to choose. I would love that pack of candy bars! Thank you so much for a really great giveaway! Such lovely fabric, who can resist candy bars!! They are my favorite. A spoonful of yummy goodness looks wonderful as well. I am a new follower. Looking forward to your next posts. Holy smokes, when you organize you do it right. 3 things to give away -oooohh ahhhhh - I am loving the art gallery fabrics. Ooh such wonderful things! If I won, I'd love the Moda candy bar or the Art gallery fabrics. Thank you for having this giveaway! I like the spoonfuls-never heard of those before. Thanks for the chance to win. Ooh, those candy bars look yummy! Thanks for the chance to win. 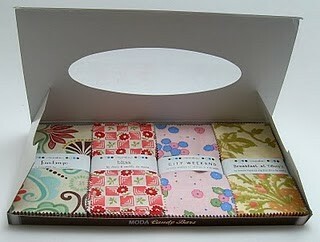 I'm soooo tempted by those candy bars and all of the different fabrics in that pretty box! I would love to win the fat quarters. Thanks for the opportunity. I am your 46th follower. Thanks for the opportunity to win that fat quarter bundle. What great giveaways! I would love to win the Girly Girl fabrics! Thanks! I am a new follower, thanks for the giveaway! I love the Girly Girl Fabrics of fat quarters! Thanks for the chance to win! I am a new follower! I have such a sweet tooth....I would love the candy bars! Thanks for a chance to win such a fabulous giveaway! I'm a new follower. Thanks for having such an awesome giveaway! I'd like number 3 the best. Thanks! I would love any of these. My first choice would be the candy bars, then the FQ's. I am a new follower, and look forward to getting to know you. I like smaller blogs like yours. I like the Spoonfuls best, but any of them would be wonderful. Thanks for the chance to win. I'm a new follower. I love the read flower one in first set quite pretty new follower thanks for giveaway. I love all the fabric but to pay by the rules. I like the two blue ones best. maybe the left blue one best. Thanks for the chance to win. OH I love the Moda bar! I am a follower too! The candy bar looks yummy to me! Thanks for the chance and your generous offerings. My top choice would be #3, as I would put the darker fabrics towards the quilt I'm planning for my older daughter, and the lighter fabrics toward the quilt for my younger daughter. My second choice would be the candy bar :) Thanks for the chance to win! I'm following you through Blogger & RSS. What wonderful giveaways! I would love #1 as I have never seen or worked with Moda candy bars yet. Thanks for offering these. In this case, all these fabrics agree with me! In the order of #3,#1,#2, Happy leap year day. Hello, I really like the Candy Bar set. But any of the prizes you have would be wonderful. I am also a follower. Thanks for the chance. What lovely fabrics! I have to go with the Moda Candy Bar.. so lovely! Thanks for a chance to win some fabric! such a lovely giveaway, Thanks for the chance to enter. Would love to be in for the candy bars or the charm squares. I like the candy bars best, but they are all lovely. I'm a new follower. Thanks for a chance to win. Hi! I'm a brand new follower. The candy bars are my favorite, but I could have fun with any of these! your blog! Thanks for the chance to win! i now follow, and although i'd be happy to win any i do like the girly girl ones! I love the Girly Girl fabric and I'm now following you. I'm already a follower and would love the Moda candy bar. I would love to win the Moda candy bar, please! Hi there :-) I hopped on over on the blog hop. Great giveaway, I think I will put them in order of preference like some other have done. So, favourite first, 1, 3, 2. Happy Leap Day. I'd love to win bundle #3, but 1 and 2 would be close seconds. Lovely prizes! I like the Girly Girl fabrics best, Candy Bar second. Thanks for the chance. I like the candy bars. Hope I win. I would pick the candy bar pack... then the bundle #3. Thanks for the chance! Ohh I can't decide between the candy bars and the FQ bundle, do I have to decide? Happy to be a follower. I would prefer the Girly Girl fat quarters. Looks like the perfect fabric to come up with something special for my granddaughter. Thanks for the opportunity. I love all the giveaways but would really love to have the Moda Candy Bar, then bundle #3. I just became a follower so am entering again and still pick the Moda Candy Bar as my first choice. I am a new follower! I have never seen the spoonfuls b4 so an up close look would be great! Thanks for the lovely fabric giveaway. Any of these 3 would be fine with me - but if must choose will say in order of preference from highest down #1 #2 #3. 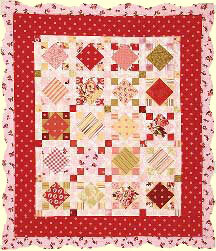 You are now following Kenna Quilts! I love the fat quarters, #3. But all are just as lovely. Thank you so much for the chance. MODA Candy Bars, hands down! I'm following your blog now. I love the Candy Bar - figures, I'm a chocoholic! I'm a new follower #79. Thank you for participating in the Leap Blog Hop....it is a great way to meet new bloggers. 3 great prizes....if I have to pick a favorite...this is the order I would pick #3...then #1....then #2. Happy Leap Day!! I really like the fabrics in the candy bar, but I'd really be happy with any of them. Thanks for the opportunity to enter your wonderful giveaway. Love the candy bar Moda pack. HAPPY LEAP DAY TO YOU AND YOURS!!! What great fabrics. I think I like set#3 the best. Any of those are great. I would pick the candy bar first as I have never worked with them before but the quilt pattern of #2 is really cute. I love spoonfull. Thanks for the opp. to enter. I would love the candy bar! wow, those candy bar fabrics are too yummy! I'd love to win those. Thanks for the opportunity, I'm a new follower. and you've got yourself another new follower. All the fabric is beautiful, but I love the candy bars! Thanks for the giveaway! How intriguing! I have never seen the candy bar packaging before; however, all of your prizees are fab! The fat quarters would suit me just fine. I'm also a follower. Thanks for offering. I'm a new follower and I'm not fussy - all 3 choices are great! Thanks for the chance to win. I am one of your newest followers ;) Yippee Skippee!!! I like them all...but in order #3, #1 and #2. They are all gorgeous. Thank YOu. 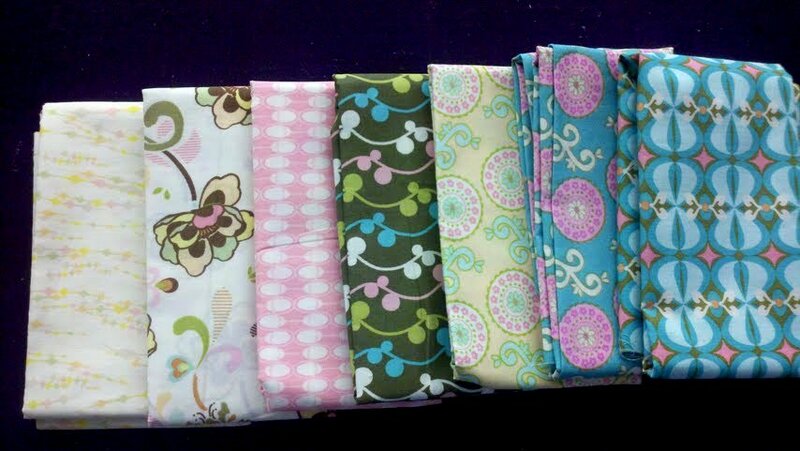 I can't decide between the candy bar fabrics on the girly girl prints. I guess it only matters if I win. Hoppy Leap Day: I love all 3, that is so nice of you to pick great giveaways. Love your blog. If I had to pick, I think the MODA candy bar would be a fun pack to work with. Never have had these before. I just became a follower and looking forward to viewing your blog more. I'd love the Candy Bar. Thanks so much for the chance. I love the candy bar the most I think, but that fat quarter bundle is pretty sweet too!! Happy Leap Day! I am a new follower. Love what I see so far. Thanks for the give away. I like number 3, the fq. I would love the moda candy bar, always wanted one. But I like all three so if it is gone when you draw my name either of the others are just beautiful too. Thank you for the great giveaway. I love them all! Thank you for such a generous giveaway! My preference would be 3, 1, 2. Thank you for participating! Ooo...love those girly girl fabrics! With four granddaughters I'm sure they would go to good use! I'm a new follower. I like the Spoonfuls prize. Thanks for the chance. Would love to receive this giveaway! Thanks for the chance! I ould love the candy bars - partly because I have never seen them in the flesh. And who can resist candy? Lovin' the spoonfuls - thanks for the chance to win - I'm a follower. How wonderful! Thanks for the chance! I think I'd pick in this order -- 3,1,2. I would like the candy bar pack - I have never seen one of those! What a lovely giveaway! Thanks for a chance to win! I'd love number 1 or 3!!! so beautiful! Love ALL the fabrics, but the candy bars caught my eye! (Maybe because they make me thing of CHOCOLATE??!!) Thanks for sharing! All the fabrics look wonderful. I would choose the FQ bundle. Like the colors and have a project in mind. Thanks for the chance. Lovely! The Girly Girl prints are pretty! Oops. Forgot to mention. I'm a new follower. All the fabrics look wonderful and I can think of several ways to use them all but I am most partial the first and third fabric packages. Thanks for the sweet invitation to become one of your newest followers. I can't decice - Art Gallery or the Candy Bar both are gorgeous! Gosh! I do like all 3 ! Thanks for this wonderful giveaway. It's been fun! I would be thrilled to give any of these prizes a home! I've never seen a Moda Candy bar or even heard of Spoonfuls before. At least I know what a fat quarter is! You pick for me. Thanks for the chance. I am a new follower. I can't pick. I like it all. I guess the fat quarters are the best. Thanks! Hi Kenna! I'm now your new follower too. Nice to *meet* you! Hard to choose.All are awesome.This is my order:1,3,2.Thanks for the chances! Hi! thanks for the giveaway! I am a follower! either 1 or 2 woud be terrific! Love the Moda candy bars, but would love any. I'd pick #1. I'm a new follower! Great giveaway. I like the Moda Candy Bars, #1. I am a follower. This is a very hard choice. I would love each one of these but my preference is #1, #3, and then #3. Mmmm Mmmm Good! Candy Bars! I do love them all... The Marcus Brothers looks good too- as does the third choice. Oh my, I think this has been my favorite giveaway of all I've hopped to tonight!!! I love the first candy bar pack but also the Spoonsful too. Maybe that one the best. Thanks for the chance. I'm easy! Any of the three would appeal to me. I make so many quilts for others that it works for someone! I've never owned a candy bar set so that would be my first choice, than the 8.5" squares than the fqs. What fun fabrics! I like them all but the art quilt fat quarters are so bright and girly. I had heard of 'candybars' but didn't know you got 4 different fabric lines! We would love the candy bar pack. Hummmm... I think I would have to go with the Spoonfuls lol. Thank you so much and Happy Leap Day!